History repeated itself in downtown Herndon on Sunday, March 17, when Mosby’s Raid on Herndon Station was reenacted on the 150th anniversary of the original event. On March 17, 1863, John Singleton Mosby and 40 of his rangers surprised and captured 25 members of the First Vermont Cavalry, including Major William Wells and three of his fellow officers. On that day, troopers from the First Vermont Cavalry were relaxing near the Depot and a nearby sawmill. Because Herndon and the surrounding areas were supposed to be occupied exclusively by Union forces, when Mosby and his Rangers arrived at nearly the same time as a Union relief detachment was expected, the members of the First Vermont were taken completely by surprise, having mistaken the Rangers for Union troops. Mosby was somewhat surprised himself. “I could not imaging why such a number of men should be put there, except for the purpose of getting caught,” he wrote later. The reenactment—which featured members of the Fourth Virginia Cavalry Black Horse Troop—was sponsored by the Historical Society and the Herndon Chamber of Commerce, with support from the Town of Herndon and Herndon area businesses. Many thanks go to Richard Downer and Chuck Mauro, who produced this great event and to all the reenactors who participated. The Historical Society also would like to thank Gary Mester of Written in Light Photography for allowing us to use his many wonderful photos. 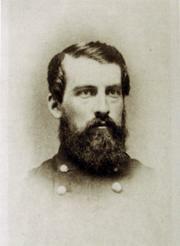 Many Herndon residents are familiar with Confederate Captain John S. Mosby’s raid at Herndon Station on March 17, 1863. But few may be familiar with the story of a famous Union Officer who was also involved in that raid, Major William Wells. 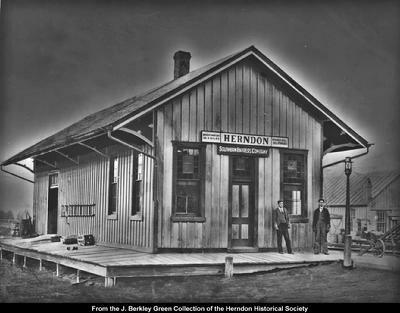 On March 17, 1863, Saint Patrick’s Day, Captain John S. Mosby made a raid on a Union outpost near one of his favorite targets, the Herndon train station on the Alexandria Loudoun & Hampshire Railroad. This raid also involved Kitty Kitchen Hanna, one very frightened resident in the village of Herndon. A Union picket post had been deployed at a sawmill near the station at the intersection of today’s Elden and Center Streets. The post consisted of 25 men under the command of Lieutenant Alexander G. Watson, Company L, of the First Vermont Cavalry. At noon, Mosby approached the Herndon train station. He came out of the woods with 40 men who were wearing blue overcoats to cover their gray uniforms. Watson’s men saw Mosby and his men coming, but—having been on duty for 48 hours—they thought they were a relief party. The Union soldiers did not realize their mistake until Mosby’s men made their charge and quickly captured most of them, the rest electing to surrender. Who Was John Singleton Mosby? Much has been written about Mosby’s Raid on Herndon Station, but who exactly was Colonel John Mosby? John Singleton Mosby was born in 1833 in Powhatan County, just west of Richmond, Virginia. He was named after his grandfather, John Singleton. When he was a young boy his family moved to Albemarle County, near Charlottesville. He was a small and sickly child. He was often picked on by school bullies, fighting back but always losing. As an adult he was 5’8” and weighed only about 125 pounds. He enrolled in Hampden-Sydney College in 1847. He left that school after two years and later, in 1850, he enrolled at the University of Virginia. He excelled in literature, Latin, and Greek but struggled with math. William Wells was born in Vermont in 1837 and attended school at Kimball Union Academy in New Hampshire. When the Civil War broke out in 1861, William and three of his brothers joined the Union Army. He enlisted as a private and joined the First Vermont Cavalry. Within months he was promoted to 1st Lieutenant, and soon after to Captain. By 1862 he had earned the rank of Major. On March 17, 1863 — St. Patrick’s Day — Capt. 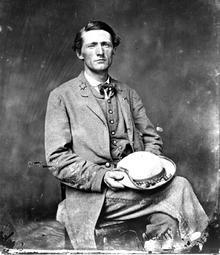 John Singleton Mosby made a raid on a Union outpost near the Herndon train station on the Alexandria, Loudoun and Hampshire Railroad. This raid involved a very frightened resident of the village of Herndon. A Union picket post had been deployed near the station comprising 25 men under Lt. Alexander G. Watson, Company L of the 1st Vermont Cavalry. At noon, from out of the woods, Mosby approached the station with 40 men and came upon the pickets who were stationed around a sawmill. Watson’s men saw Mosby coming, but having been on picket duty for the past 48 hours, thought this was a relief party. Mosby’s men were wearing blue overcoats over their gray uniforms, which confirmed their belief. The Union soldiers did not realize their mistake until Mosby’s men made their charge and quickly captured most of them, the rest electing to surrender. As the Confederates were leaving the sawmill, they noticed four horses tied in front of the residence of Nathaniel (Nat) Hanna, who was a known Union man. The horses belonged to Maj. William I. Wells, Capt. Robert Schofield, Lt. C.J. Cheney, and Lt. Watson, all of the 1st Vermont. Wells, Schofield, and Cheney had ridden to Herndon Station earlier that day to investigate charges that the pickets had been stealing from the local citizens, a typical pursuit for Yankee soldiers. The four officers had been inside eating a meal provided by Hanna’s wife, Kitty Kitchen Hanna, a loyal Southerner, when they noticed Mosby’s men in front of the residence. Cheney and Watson rushed out only to be captured. Wells and Schofield tried to hide in the attic. One of Mosby’s rangers fired a shot through the ceiling calling for their surrender, causing Maj. Wells to fall through the ceiling directly into the hands of his captors. After the war, Wells and Schofield actually returned to reclaim their guns, which they had left hidden in the walls. “Never shall I forget that St. Patrick’s Day, March 17, 1863, or them pies. As I turned from servin’ the pies, I cast my eyes out’n the window, an’ I saw comin’ a squad of grays! The rebel yell was no louder than my scream, ‘the Southerns!’ as they came tearin’ down the hill, an’ everyman at the table ran to [the] front door, the wors’ thing to do, to show theyselves!, an’ then the bullets jes’ rained on our house. The Yankees ran inside an’ I thought they was goin’ to fight it out, but they buckled on sabres, they followed my brother-in-law up the stairway, till I cried out in terror. “ ’Gentlemen, go outside, or I’ll be murdered in my own house!’ Watson couldn’t stand that, so he rushed out, firin’ all the time, an so did Lieutenant Chiny; an I never saw either one on’em again, but I knew they’d been caught. Watson was a Vermonter, who was never more seen in these parts. The other two officers followed my brother-in-law to the garret (attic), which was floored all over an’ had a big brick chimney runnin’ through the roof; an’ behin’ that chimney was a dark cuddy protected by a closet on one side, with only three boards for floorin.’ The three men crawled in there, an’ while they was hidin’, Mother an’ me ran over to Betsy Allen’s. “I looked down toward [the] mill an’ saw the line of boys in blue standin’ with their sabres up, an’ I felt sure they would all be kilt, so I turned my back not to see it, leavin’ those men hidin’ in the attic. We could hear the Southerns rush in the house shootin’ and bangin’, an’ I felt certain no one would be lef’ alive. Within a couple of weeks, Mosby’s men rode by again, stopping at the Herndon Station across the street from Kitty Hanna’s house, “but the leader rode into our yard an’ lef’ his horse standin’ an’ knocked at the front door. ‘Madam,’ he says, ‘I come to apologize to you for my men shootin’ at your house a week or so back.’ ‘So they did,’ I replied, but said no more. ‘Can you let me have a newspaper to read, Madam?’ (There was a pile inside but I answered) ‘No, sir, I can’t.’ Mosby was too polite to insist, an’ he turned an’ walked away. Kitty Hanna survived long after the war, granting an interview between 1905 and 1906 on the story of her life in Herndon. There is no doubt that every St. Patrick’s Day she had a special story to tell about John Singleton Mosby and her pies.